Cleo is my Cousin's daughter. We have been taking pictures of her since she was just a few days old. We had a big party for her yesterday and on the left is a photo of her sleeping quietly while the big party was going on. Here are a couple more pictures of her. The one below was taken when she was 3 weeks old. 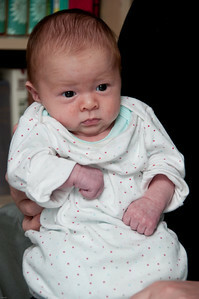 And this one was taken when she was just a few days old. You can see that she is growing very fast. Check out her other pictures in the "Client Login" section. If you know her family, you should know the password to login. I am sure we will be taking more pictures of her in the future.